Should companies hire external CEOs? More than half of top bosses hired last year in the UK came from outside their business - bucking the global trend. The internal versus external hiring debate is one that has rumbled on for time immemorial. Somebody like new M&S boss Steve Rowe, who has spent his entire working life at the retailer, will know the business and its customers inside out. 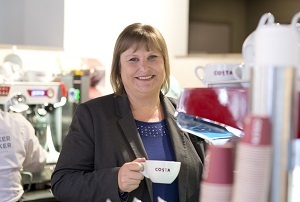 But on the other hand an external candidate, like the new Whitbread boss Alison Brittain (formerly of Lloyds, pictured), comes with fresh ideas and a lack of baggage that allows them to really shake things up. This surge in external hiring perhaps reflects a sense that the country’s businesses are going through profound change at the moment. Digital technology has been around for a long time now but it’s only in the last few years that many of the nation’s boardrooms have woken up to just how significantly it is going to change their business models – whether they’re in retail, banking, gambling or transport. In times of profound change a new pair of eyes can be invaluable. The research suggests this might not be working though. While on a global level external hires tend to do better than their internal counterparts (measured by average shareholder return), in the UK that’s not the case. What’s more, externally hired CEOs are more likely to get the sack. Over the last four years, 29% of departing externally-hired bosses have been forced out, compared to 19% of internal hires. That’s not a totally straightforward comparison though. To an extent it reflects the difference in approach between those kinds of businesses that are likely to hire externally or internally. Boards that favour homegrown candidates for their long-term view are more likely to tolerate some short-term performance problems. Those who get their chequebook out for a high-flying mercenary will be understandably less forgiving.